If you’re lucky enough to have a good farmers market nearby, as we are in Portland, you might see all sorts of raabs (or rabe)—kale raab, collard raab, even Brussels sprout raab. But what are they? They are, simply, the flowering stems of the plants that fall into the very large family called brassicaceae—the cabbage or mustard family. In this family are vegetables like cabbage, cauliflower, kale, broccoli, turnips, mustards, kholrabi and radishes. Just as herbs bolt, flower and then go to seed, so, too do these plants. 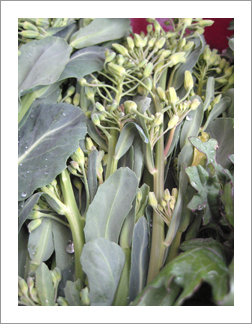 For example, Brussels sprout raab are the flowering stems in spring from the fall crop of the vegetable. Once upon a time, these rabes were considered “farmer food” and were among the few greens still growing in late winter. They weren’t considered good for market mainly because they’re not available long enough for grocery stores to bother. But times have changed. People are willing to try new things. And farmers are willing to bring rabes to market. The varying textures of the stems, leaves and flowers are appealing, as are their color variations. Each tastes slightly different and most are more mild than broccoli rabe, which can be quite bitter. All are very nutritious—and include vitamins like C, A or K and potassium, calcium and iron. And many have anti-cancer properties and are high in antioxidants. One of the best ways to cook raab is to boil just til the stems are tender and then drain. Heat some olive oil in a skillet, add some crushed garlic and a pinch of red pepper flake. Add the rabe, tossing with tongs till coated with oil and seasoning. Add salt and pepper to taste and a squeeze of lemon. In Southern Italy, broccoli raab is eaten in abundance, and one of the most popular dishes of the region is Orecchiette con cime di rapa. Give the anchovies a try even if you think you won’t like them. Like fish sauce in Vietnamese and Thai cooking, they’re meant to add depth, not impart a fishy taste. Follow this loosely—varying the amount of pepper, anchovies and greens. Rapini cooks down much like spinach because it’s mostly leaves. You can also download the recipe. 1. Put a big pot of water on boil with plenty of salt. 2. Lay the whole bunch of rapini on a cutting board and roughly chop into 2-inch (or so) sections—using the greens, stems and buds. It will seem like a lot but it cooks down. Rinse and drain the greens, leaving a bit of water on the leaves (for steaming during saute). 3. In a big skillet, heat the oil and saute the garlic, anchovies and red pepper. Don’t let the garlic burn. Using a wooden spoon, smash up the anchovies till they melt. At the same time, add the pasta to the rapidly boiling water (both the pasta and the rapini take about 10 minutes, so you can do them at the same time). 4. Add the rapini to the skillet and saute over medium heat. You may need to allow some to wilt before adding the rest. Add a little salt (not so much because the anchovies have salt, as does the pasta water). Cook the rapini till the stems are just tender, but not overcooked. 5. Halfway through the pasta cooking, scoop out about 1/2 cup of the pasta water and set aside. Cook till just tender, or al dente, and drain. 6. Add the pasta to the skillet with the rapini, stirring to combine well. Add some of the reserved pasta water, the starch of which combines with the olive oil to create a sauce. Add salt if necessary. 7. Serve sprinkled with some fine breadcrumbs. This dish is excellent with a Primativo or Salice Salentino (both hearty reds from Puglia). Note: You can try boiling rapini first and then sauteing, but I find that sauteing alone is sufficient and the rapini is less soggy (the stems of rapini are less woody than some of the other rabes). Some recipes call for sausage, and some call for parmigiano (a little odd since Italians don’t normally mix cheese with fish). In other words, look for other recipes and experiment. It might seem strange to serve with a hearty red but the dish is hearty, and Puglia is not known for its white wines. An inexpensive Salice Salentino is available at Trader Joes. I had a small bunch of kale raab and wasn’t sure what to do with it. I followed your directions for the best way to cook them and it was wonderful. I’m going back to get some more before they are gone. Thank you so much!! Jacque, I’m glad you dove in and tried it!